The changes in and challenges of reaching customers in both consumer and business markets will be the focus of discussion among marketing leaders from across the country, who will be gathering next week in East Lansing for the Forbes CMO Alumni Symposium. “Connecting with Customers: Growth, Disruption, and Innovation in a Changing World” is the theme of the symposium, being held at the Wharton Center’s Pasant Theatre on Friday, Nov. 2 from 8:30 a.m. to 3:30 p.m.
“Nothing is more fundamental to business than a firm’s ability to create mutually beneficial relationships with customers. 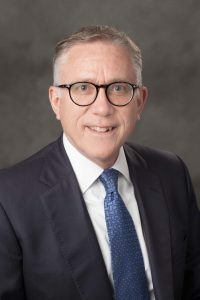 Yet, businesses are challenged by an increasingly complex and competitive environment marked by disruptive technologies and continuous innovation,” said Douglas E. Hughes, chairperson of the Department of Marketing and the United Shore Faculty Fellow in Sales Leadership at the Eli Broad College of Business. Panels will look at building brands through customer engagement; powering marketing strategies through technology and data; and achieving competitive advantage through superior value creation. The partnership with Forbes and prominent CMOs from various industries “is important for MSU, the Broad College, the marketing department, and their various constituents in that it is representative of our mission of creating and disseminating knowledge through collaborative relationships while developing transformational business/marketing leaders who make business happen,” Hughes said. Registration for the event closes Friday, Oct. 26. To register and for a full list of guest speakers, visit the event’s online registration page on the MSU University Advancement website.